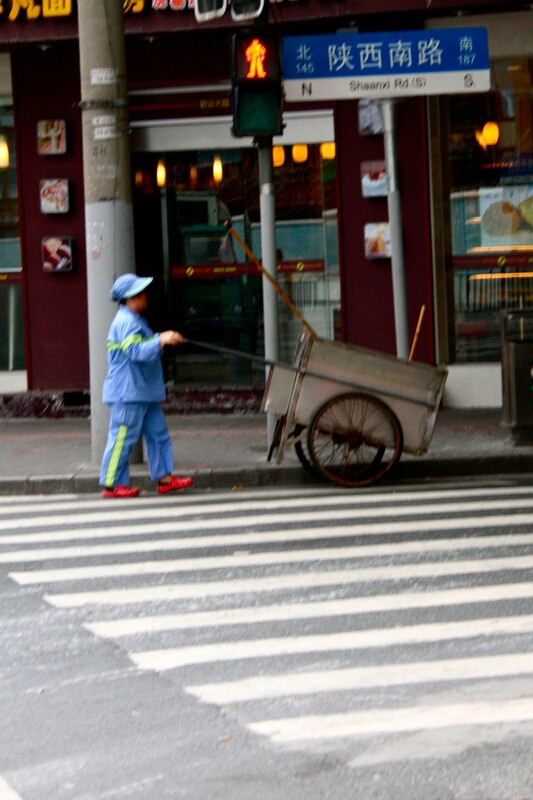 All over Shanghai are thousands of blue foot soldiers, whose job is to wage war on litter. You may find it surprising that Shanghai is one of the cleanest cities in the world, thanks to these guys and their dedication to their strip of street. It's cleaner even than New York or London, and certainly Naples. (I should qualify that really, by saying that's it's one of the cleanest cities only if you don't count restaurant kitchens, wet markets, and don't include spitting as a form of dirt. Shanghai probably wins the prize for the most spat upon city in the world, hands down). 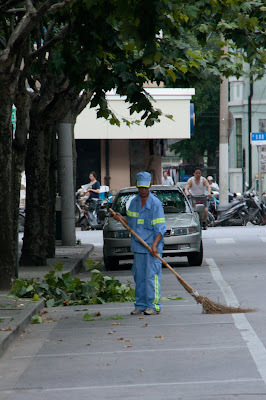 Every day, from 4am, the blue street army gets to work on leaves, trash, and dirt, sweeping it all into piles with their bamboo leaf brooms, and sorting out anything that can be recycled. (A Chinese friend looked dumbfounded when I criticized his habit of throwing empty plastic drink bottles onto the street. 'But how will the street sweepers earn money from recycling it if I take it home?' he asked. Fair enough.) The rubbish all goes into a tin trolley with a lid which can be wheeled from place to place. The sweeping is very methodical and thorough. You start at one end of your patch, footpath first, then road, and work your way to the other, and repeat for 12 hours. Time off sweeping between 3pm and 4pm is permitted, during which you make the next day's broom from bamboo cuttings delivered for the purpose. You don't want to get in the way of the end of that long-handled broom either. These guys get into a repetitive sweeping trance and they'll take your eye out before they'll break rhythm. I remember trying to get some early 'morning-after-the-night-before' photos last Chinese New Year's Day, only to find that the entire city had been swept clean of the detritus of five million firecrackers by 6am. There was no evidence Chinese New Year had ever occurred except for the smell of sulphur and phosphorus still hanging in the air, and the occasional scorched patch in the middle of a road. Amazing. 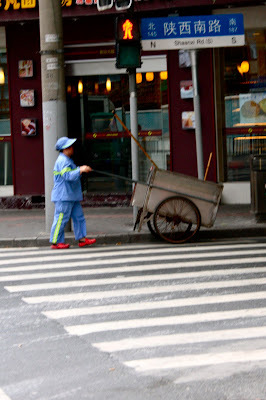 Of course, progress leaves nothing in its wake, not even Shanghai street sweepers with hand-made bamboo brooms and tin carts. Ever since Expo began, motorised white and blue scooter bins have been appearing on the streets. The street sweepers lucky enough to get one of these babies spend a lot of time lounging around the scooter or sleeping on it whilst parked. 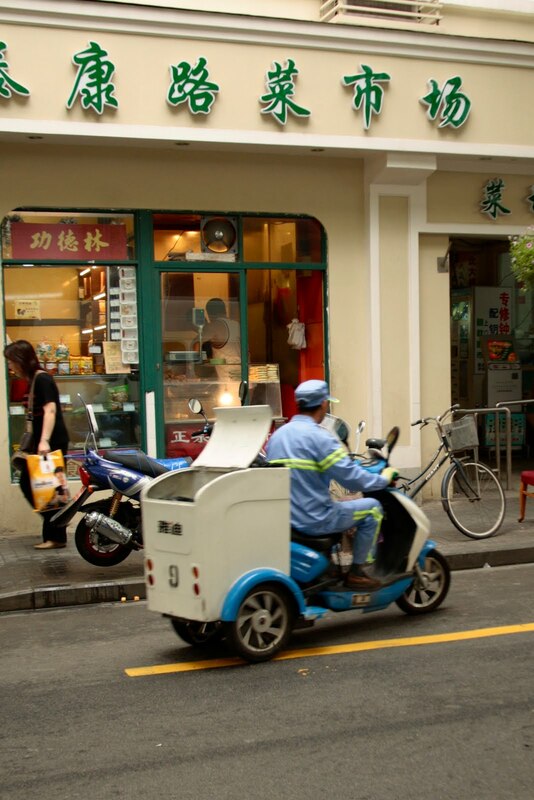 They hang out together in little scooter-street sweeper gangs at lunchtime, looking like a way less cool Chinese version of the T birds from Grease, wearing blue pyjamas.